Nukepro first reported on a massive uptick in shark attacks in 2012 and 2013. Then we didn't hear anything on main stream media in all of 2014. Not one single report. Now that I decided to revisit the issue, the results are startling, the massive amounts of attacks on humans continue. In fact in one WEEK in 2014 Hawaii had three "non-provoked" shark attacks, and 4 shark attacks in a 2 week period. What does that mean "non provoked". Well it means just a totally random attack. If you are spearing fish (I used to do this all the time) you are "provoking the shark", if you are fishing, you are provoking the shark, if you are night diving and grabbing squeaking lobster and crabs, you are provoking the shark. So this is another way for the government to lie about statistics. God forbid that you actually try to go fishing? Sheesh, cannot believe you are provoking those sharks. Of course like the plot in the Jaws movie the locals have a lot invested in making sure that Shark Attacks are kept to a minimum in the news. All in all, you're more likely to die from a dog attack or a falling coconut than a shark attack. In November 2014 there were 4 shark attacks in Hawaii in 2 weeks. I am losing my thrill for SCUBA diving, although somehow sharks rarely attack SCUBA peoples, I think the bubbles scare them somehow. By July 2014 there were 5 unprovoked attacks in Hawaii. But in fall there were 4 more in the space of 2 weeks. 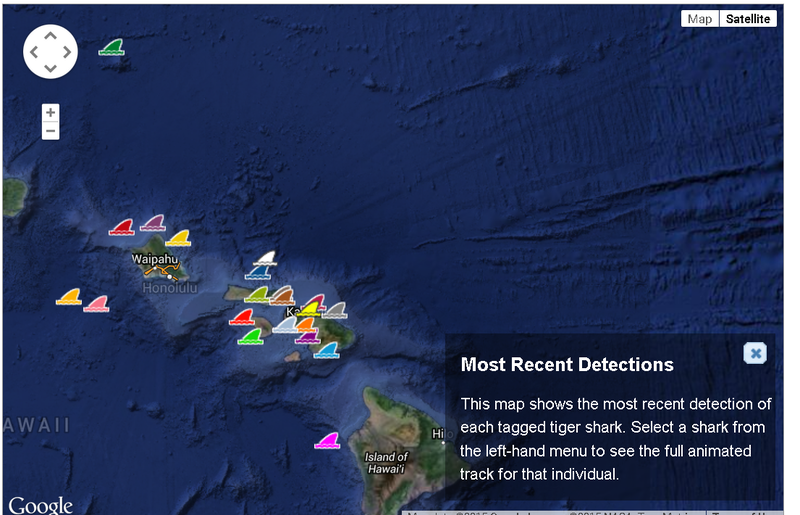 Here is a shark tracking service, will this make people more comfortable? ITS THE RADIATION DUH! And the decimation of the food chain. Sharks are becoming more aggressive. Are they pissed or just hungry? Or crazy from radiation? Very insightful. This has me madder than the Mad Hatter. The cover up is shameful. No news is good news right. BS Who is monitoring this situation? NRC and TEPCO? Liars both. Where are the experts? Sorry to rant about this. I searched the internet last night but failed to find any expert commentaries on Fukushima. No one talks or reports on the massive melted fuel rods burning. They just report the cooling of the reactors like everything is just hunky dory. How do we motivate independent factual reporting of this issue. Again sorry about ranting and rambling on. Right now as far as I can ascertain there is no available technology to fix this problem. Their best estimate for clean up and shutdown of Fukushima is 40 years. Ecological impact unknown. Extinction of massive life forms imminent. Millions of people will be affected in the Northern Hemisphere. Thanks for letting me get this off my chest. We are there with you..OUTRAGE at all gov.s and world leaders,Japan..Shame on the LIARs..Go to Enenews.com for REAL info on Fuku..I must say its hopeless and we people are doomed..mass die offs in 13 were worst ever in our world history..Go to Enenews,com..peace to you.